A couple of years ago, for instance, the firm was looking to hire a CFO for one of its portfolio companies. The leading candidate had a top-notch CV, a solid track record and had done reasonably well in the company’s case study-based job interviews. But the Sovereign team still “felt a niggling worry about him” they couldn’t quite put their finger on, Owen recalls. All of Sovereign Capital’s prospective hires are required to take the Trait Emotional Intelligence Questionnaire (TEIQue), developed by Thomas International, the U.K.-based assessment company. Once this particular candidate’s results came back, the partners immediately identified the root of their concern. Emotional intelligence assessments — tests that measure our ability to use emotions as information, and reason about those feelings — are becoming an increasingly common part of the hiring process. Nearly 20% of organizations use personality or emotional intelligence tests in hiring or employee promotion, according to a survey conducted by the Society for Human Resource Management (SHRM) in 2011. The survey found that nearly three-quarters of HR professionals say that the tests are helpful in predicting job-related behavior or organizational fit. A growing body of research indicates that emotional intelligence is a powerful predictor of job performance.A meta-analysis by researchers from Virginia Commonwealth University, published in 2010 by the Journal of Organizational Behavior, found that emotionally intelligent people make better workers.Daniel Goleman, the psychologist who helped introduce EQ to the masses with his 1995 book, Emotional Intelligence: Why It Can Matter More Than IQ, whichspent more than a year on the New York Times bestseller list, has also written extensively about the subject. A study published last year in Harvard Business Review found that service companies, including retailers, call centers and security firms, reduced costs and made better hiring decisions by using short, web-based psychometric tests as the first screening step of the recruitment process. “Such tests efficiently weed out the least-suitable applicants, leaving a smaller, better-qualified pool to undergo the more costly personalized aspects of the process,” the study notes. Many companies see EQ assessments as cost-savers. After all, the expense of a bad hire adds up: The company spent money to recruit and train that hire, and now it must spend money on his or her severance package — not to mention grapple with the dent in employee morale and countless lost hours of productivity he or she likely caused. The increasing use of EQ tests comes at a time when the traditional means of vetting job candidates is under fire. Certain companies, like Google, are turning away from looking at traditional indicators of success like a job candidate’s grades and standardized scores. Laszlo Bock, the senior vice president of people operations at Google, told TheNew York Times recently that such achievements are a “worthless criteria” on which to evaluate an applicant. Perhaps the biggest question mark around these tests is: Are they accurate? The answer, of course, depends on the test. 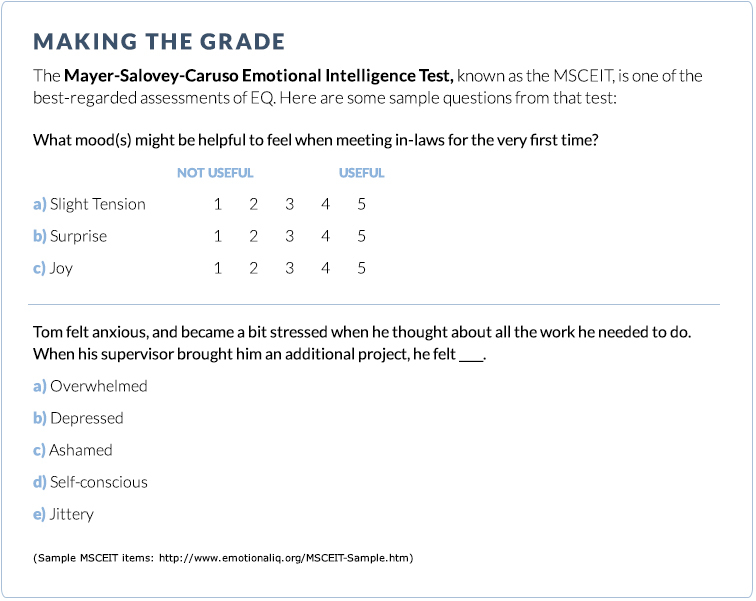 While some assessments provide a reliable measure of emotional intelligence, others are easily manipulated and produce wildly varying results. This explains why some firms are reluctant to use these tests in the selection process: The questionable validity opens them up to potential lawsuits from candidates who might claim they were denied a position because of an emotional disability, such as post-traumatic stress disorder. Some other kinds of emotional intelligence tests, meanwhile, mainly ask questions pertaining to personality and social preferences. “Myers-Briggs tests are notoriously unreliable. Even the test publisher does not recommend companies use it for personnel selection,” says Ben Dattner, an executive coach and organizational development consultant. “Faking it” is another big concern. Professionally developed psychological tests have built-in measures designed to identify dishonest answers or raise flags when a subject only answers questions in a socially desirable way. “And yet a cynical case could be made that answering questions in a way that will be looked on favorably by an employer is, in itself, a social skill that requires emotional intelligence,” Dattner points out. Say, for instance, a job seeker has a tendency to lose his or her temper when stressed. If the test asks how the person would handle tense situations, and a job is on the line, their incentive to be objective and honest is low. “There’s something riding on the outcome of your answer, [so] you’re going to say: ‘I take a deep breath and a drink of water and I am fine! '” says Wharton’s Cobb. Two things; the selection process should try to triangulate results of EQ, CV and interview to get the best perspective of a candidates profile. Secondly, I fail to understand why such methods are usually limited to selection of junior level managers/executives only? Good article. I question what the drivers are behind adding this to the process for hiring and can see why it potentially would only be used for senior management positions. What are we really trying to discern about the candidate with this approach? Given our social outreach and involvement are the risks so great these days that everyone needs a psych test?